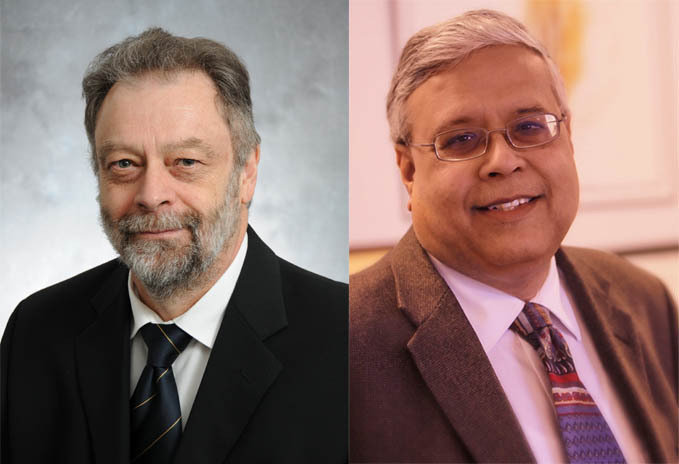 Robert Baker (left) will join McMaster as dean of science, and Ishwar Puri (right) will be dean of engineering. The new deans both begin their terms July 1. A new dean of engineering from Virginia Tech and a new dean of science from the University of Toronto will join McMaster on July 1. Senate and Board have approved the appointments of Ishwar Puri and Robert Baker. Robert Baker will be returning to Hamilton as McMaster’s new dean of science. He was raised in the city before leaving to earn his BSc from the University Guelph, and his MSc and PhD from the University of Alberta. He joined the University of Toronto in 1982 where he was the inaugural chair of the biology department, associate dean of science at the University of Toronto Mississauga and served the Faculty of Arts and Science at the UofT’s St. George campus as vice-dean of Graduate Education and Research and vice-dean, Research and Infrastructure. His most recent research considers the effects of pollutants such as road salt and herbicides on freshwater insects and amphibians. “One of McMaster’s core strengths is its interdisciplinary approach in both research and teaching and I’m looking forward to broadening the Faculty’s outreach across the campus and helping to develop the ways in which the Faculty’s many research strengths can enhance the experience of students at both the undergraduate and graduate levels,” said Baker. Puri currently serves as head of the Department of Engineering Science and Mechanics at Virginia Tech. He has been elected to fellowship in the American Academy for the Advancement of Science for his work in the areas of combustion and transport phenomena, and is the N. Waldo Harrison Professor at the University. He obtained his PhD and MS from the University of California San Diego after earning his BSc from the University of Delhi (Delhi College of Engineering). His most recent research has been in nanoscale heat and mass transport, has led initiatives in nanotechnology education, engineering ethics and the globalization of higher education and research, and has mentored start up entrepreneurs. Both appointments are for five year terms. A new dean of engineering from Virginia Tech and a new dean of science from the University of Toronto will join McMaster on July 1. Senate and Board have approved the appointments of Ishwar Puri and Robert Baker. “We have recruited two outstanding candidates,” said provost David Wilkinson. “Each combines stellar careers as researchers, educators and leaders and are enthusiastic about joining a university that combines research excellence with a passion for innovative teaching and a commitment to community and global engagement.” Robert Baker will be returning to Hamilton as McMaster’s new dean of science. He was raised in the city before leaving to earn his BSc from the University Guelph, and his MSc and PhD from the University of Alberta. He joined the University of Toronto in 1982 where he was the inaugural chair of the biology department, associate dean of science at the University of Toronto Mississauga and served the Faculty of Arts and Science at the UofT’s St. George campus as vice-dean of Graduate Education and Research and vice-dean, Research and Infrastructure. His most recent research considers the effects of pollutants such as road salt and herbicides on freshwater insects and amphibians. “One of McMaster’s core strengths is its interdisciplinary approach in both research and teaching and I’m looking forward to broadening the Faculty’s outreach across the campus and helping to develop the ways in which the Faculty’s many research strengths can enhance the experience of students at both the undergraduate and graduate levels,” said Baker. The Faculty of Engineering’s vision of creating global citizen scholars with a focus on sustainability fits perfectly with the goals of incoming dean Ishwar Puri. “Engineering is a discipline that can change the world,” he said. “If we focus on our core values such as inclusivity we can create change for a better society. McMaster has a long history of leadership in these areas and I am anxious to begin working with individual faculty members and students to increase the impact of our educational and research programs.” Puri currently serves as head of the Department of Engineering Science and Mechanics at Virginia Tech. He has been elected to fellowship in the American Academy for the Advancement of Science for his work in the areas of combustion and transport phenomena, and is the N. Waldo Harrison Professor at the University. He obtained his PhD and MS from the University of California San Diego after earning his BSc from the University of Delhi (Delhi College of Engineering). His most recent research has been in nanoscale heat and mass transport, has led initiatives in nanotechnology education, engineering ethics and the globalization of higher education and research, and has mentored start up entrepreneurs. Both appointments are for five year terms.